Hi! I'm back with a little project that will be delivered to my neighbors today. I made these yummy treat boxes, which hold homemade granola, for their holiday enjoyment. If you'd like the recipe, it's from my sister-in-law, and you can find it here. These Treat Boxes are SO easy to put together and are perfect for a quick packaging solution. I jazzed the box up with some Real Red polka-dot grosgrain ribbon and a tag from the Two Tags die. I stamped the image from Sweet Season and colored in the heart using my Real Red marker. I also added a touch of Crystal Effects to the heart, just to make it extra pretty and shiny. That's all for today. I'll have some more projects to share later this week. Bye for now! Okay so I didn't proof read my first comment before I posted it so had to delete it. Sorry. Love your project Jen! 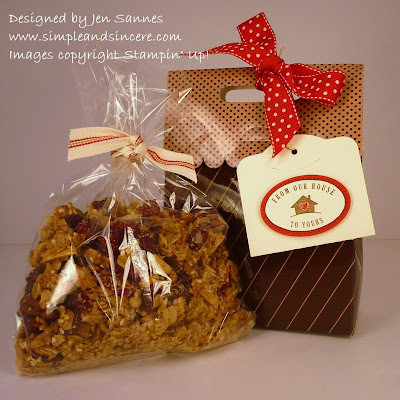 That gift bag is just darling and I am printing off that recipe right now for the granola.